It is difficult to evaluate any product based on a single pack. That problem is compounded when the product is “High Risk, High Reward” because you don’t get a good sense of how well the risk is distributed. 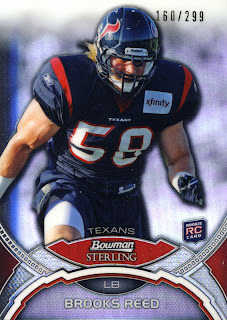 For 2011 Bowman Sterling Football, I only opened a single mini-box of five cards so while I can talk about the design and my impressions of the hits received, the majority of this review will involve a break down of the checklist and a scouring of several message boards with other people’s box break results to try and get a feel for the expectations you should have when purchasing a box. Bowman Sterling Football comes in at the high end of our premium cards category. Each hobby box contains 6 mini-boxes with 5 cards each and a box topper bonus card. Each mini-box should yield 1 Autograph and 2 Relic Cards. Here are the 5 cards we pulled from our mini-box. 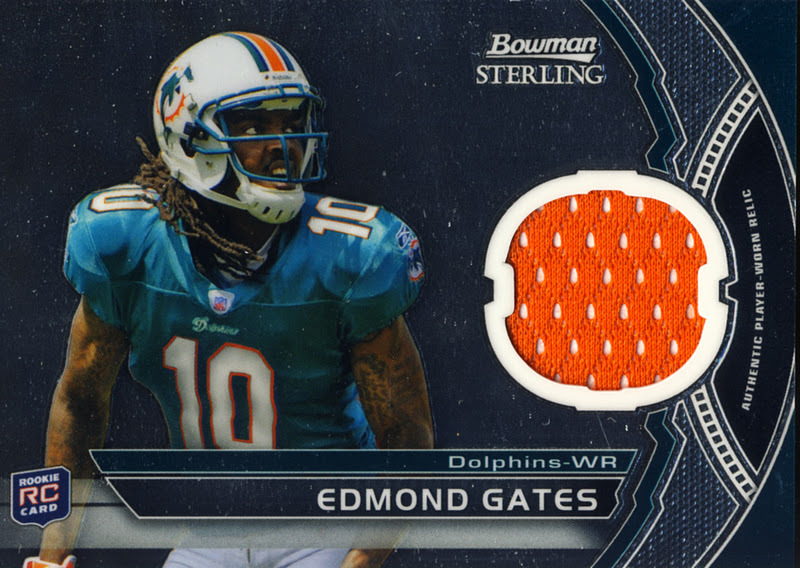 Edmund Gates Relic, not numbered. This is solid design along the lines of Premium and Finest. 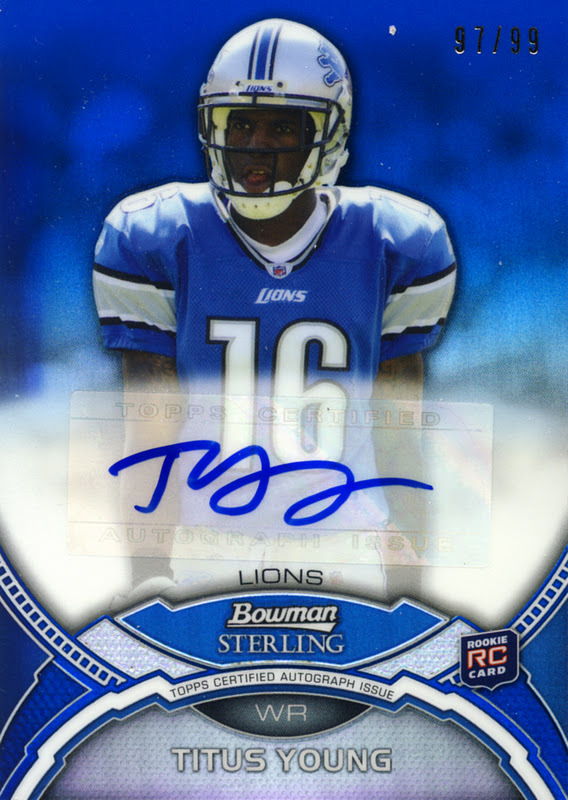 There was some slight bowing on the two base cards but the hits were nicely laid out and construction seems solid except for the askew sticker placement on the Titus Young Autograph. 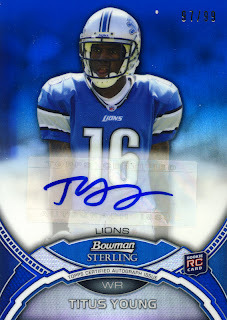 The pulsar refractors fit really well with the other types of refractors. The base set is made up of 50 rookies who did not make it to the Premiere with standouts being Roy Helu, Ryan Kerrigan, J.J. Watt, Jeremy Kerley, T.J. Yates and Denarius Moore. On average, 4 out of the 6 autographs will come from a checklist of about 70 players that include non-Premiere and Premiere rookies with a handful of veterans that include Ahmad Bradshaw, Arian Foster, Malcom Floyd, Marshawn Lynch, and Peyton Manning. 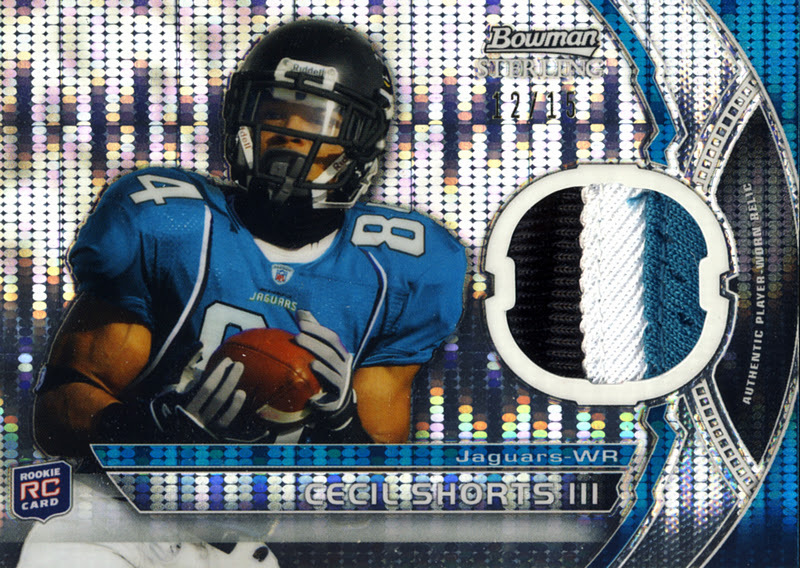 The vast majority of the relic and autograph relic hits come from the 36 Premiere rookies. If it were just based on this box alone, it would be a tough call. On the plus side, the pulsar refractor is stunning plus the addition of a blue refractor auto provides the makings of a superior box, but Cecil Shorts III... well... at least he has a cool name and Titus Young and Edmund Gates seem to pop out of almost every box we open. But that is our luck of the draw, not everybody’s. Any of the ultra desirable names and booklet cards will provide an awesome hit worthy of the hunt. From what I’ve seen, the box topper dual hits are nice too. Our box shows the “risk” part of the “High Risk, High Reward” equation. But based on the various breaks out there this seems to fall within the normal odds of this type of product. Rookie prospectors willing to roll the dice on this one will want to spread the risk over a minimum of a hobby box, f not a case to increase their chances of a hitting a low numbered card with the right player on it. 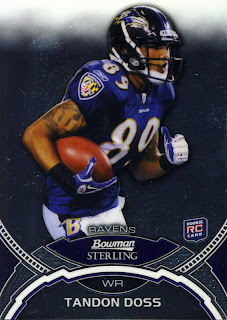 2011 Bowman Sterling Football can provide the big hits you are seeking but some patience getting there will be required.